Jamaal Charles went down without contact after he tried to cut into a hole, which he fell before he could get to, in the third quarter of today’s game against the Bears. Charles limped off the field with help. The Chiefs led Chicago 17-3 when Charles went down, but they gave up 15 straight to lose 18-17. 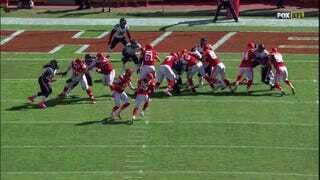 Brazilian kicker Cairo Santos missed what would have been an NFL-record 66-yard field goal at the death. Update (3:13 p.m.): Charles is out for the rest of the game. Update (4:33 p.m.): Aww hell.